US forces got a secret weapon in the fall of '42: Glenn Miller, king of velvet swing. Miller revved Allied morale in Europe—then vanished without a trace. Dismal English weather enveloped Twinwood Airfield like a wet blanket. Outside the blocky control tower that stood on the Royal Air Force base some 50 miles north of London, three American officers gazed up into the murk, listening to the drone of an airplane. A single-engine UC-64-A Norseman slipped out from the thick clouds and touched down on the runway. The three men piled into their car and drove out to meet it. They tossed in some bags, and two of them got inside while the third remained on the tarmac. “What’s the matter, Miller, do you want to live forever?” replied the colonel who had taken the co-pilot’s seat. The third man shut the door and stepped away from the plane. The pilot revved the engine and taxied back down the runway. The little plane accelerated on its takeoff run, lifted off the ground, and disappeared into the clouds and drizzle on its way to Paris. The sound of the engine slowly faded away into silence. The date was December 15, 1944. The bespectacled major in the rear seat was bandleader Glenn Miller, who was flying to Paris to make preparations for the arrival of his US Army Air Force Band. The plane never reached France. After taking off from Twinwood, Glenn Miller disappeared forever. The man whose music has come to define the war years was born Alton Glenn Miller on March 1, 1904, in Clarinda, Iowa. At the age of five, he moved with his family to Nebraska, where they lived for a time in a sod hut. Later they moved to Missouri and then to Colorado. Glenn’s father, Lewis, worked a series of dead-end jobs and never managed to get ahead financially. Young Glenn was closest to his strait-laced mother, whose “stoical, puritanical ways…were reflected in his constant, sometimes unreasonable demands for perfection in himself and in others, and in the emotional inhibitions that seldom let him show his true feelings,” wrote Miller biographer George T. Simon. As a budding musician, Miller started out on mandolin, but he eventually switched to trombone and decided to pursue music as a profession. He attended the University of Colorado, but soon dropped out to play and arrange for drummer and bandleader Ben Pollack. Another new member of Pollack’s band was a young clarinetist from Chicago named Benny Goodman, who became Miller’s roommate. Like many musicians of the time, Miller bounced from outfit to outfit, working with the orchestra of Pennsylvania brothers Tommy and Jimmy Dorsey for a time and then playing in a band led by Englishman Ray Noble. His first attempt to form his own band failed, breaking up just after New Year’s Day 1938 after a grueling stint of low-paying one-nighters staffed by a revolving set of musicians. He was right, although things started off slowly. The new band debuted on April 16, 1938, at Boston’s Raymor Ballroom, and when it reached New York, it was billed below Freddie Fisher and his Schnickelfritzers. But things soon picked up. With Gordon “Tex” Beneke playing sax and handling the vocals, the band scored big hits with “Chattanooga Choo Choo” and “I’ve Got a Gal in Kalamazoo.” Other hits included “In the Mood,” “Little Brown Jug,” and “Tuxedo Junction,” and Miller’s band became one of the most popular in the nation. It appeared in the movies Sun Valley Serenade and Orchestra Wives and had a regular radio show sponsored by Chesterfield cigarettes. For its theme song the band adopted a tune Miller had written called “Moonlight Serenade,” a piece that had been variously known as “Now I Lay Me Down to Weep,” “Gone with the Dawn,” and “Wind in the Trees” until someone suggested it would make a good companion piece to Miller’s recording of “Sunrise Serenade.” The song’s sweeping, melancholy opening notes have become one of the most recognizable sounds of the swing era. As a bandleader, Miller was a taskmaster, a demanding director who was as hard on himself as he was on his musicians. Some people complained that the Miller band couldn’t really swing, that it rehearsed away its spontaneity and produced music like clockwork. The public, however, voted with their wallets. “Chattanooga Choo Choo” sold more than a million copies on its release in late 1941, making it the first million-seller since 1926. Wanting to contribute directly to the war effort, Miller petitioned the navy for a position in the reserve. When he was turned down, he tried the army. “I should like to go into the army if I could be placed in charge of a modernized army band,” he wrote to Brigadier General Charles Young in Washington, DC, in August 1942. “I feel that I could really do a job for the army in the field of modern music.” A month later Miller received a telegram telling him the army had accepted his offer. He would become a captain and the director of band training for the Army Air Forces Technical Training Command. He reported for duty in October. It wasn’t long before Miller began to chafe at the army way of doing things. He wanted to give recruits marching music that would put a little swing into their steps. The army brass, however, insisted that he stick with the traditional material: the John Philip Sousa marches the military had been using for years. When Miller made some negative comments about Sousa to Time magazine, the outcry was so strong he wrote a letter to the editor claiming he had been misquoted. “Deprecating Sousa in those war years was like insisting your local Boy Scout troop smoked pot,” noted Simon. What Miller really wanted to do was play big band swing for American troops overseas, and in May 1943 he finally received orders to take a musical ensemble to England. He flew there a month later, with the band following on the Queen Elizabeth. Miller met his musicians in Scotland and brought them to London, but he worried about attacks from German V-1 jet-propelled bombs, so he got the band assigned to quarters in Bedford, about 50 miles to the north. The day after the band left London, a V-1 blew out the front of the building they had vacated. In August 1944 Miller was promoted to major. Then his goal became to take his band to mainland Europe to entertain the troops there, and in November he received orders to move to France. First the musicians embarked on a marathon recording binge to stockpile music to play in Great Britain during their absence. They cut their last session on December 12 and played their final live performance with their leader that same night at the Queensbury All Services Club in London. The constant performances, the nerve-wracking flights in rickety military planes, the dreary British food, and the even drearier English weather had begun to take a toll on Miller. He suffered from sinus infections and lost weight. He began to doubt his chances of surviving the war, telling others he didn’t think he would make it back to the states to see his wife and young adopted son again. Bad weather kept Miller from leaving for France as planned on December 13. He and Lieutenant Don Haynes, his second in command and manager of the band, spent the night in London playing poker and talking into the small hours. The next day, Haynes ran into Colonel Norman Baesell, who also needed to reach Paris. Baesell suggested that Miller fly with him. On December 15 Baesell got word that the weather was clearing at Bedford. A pilot he knew, Flight Officer John “Nipper” Morgan, could fly them from Twinwood Airfield. Miller knew Twinwood well. The band often flew in and out of there and had performed a concert there in August to thank the Royal Air Force for its help. That had been on a warm, sunny summer afternoon. When Miller, Haynes, and Baesell reached Twinwood by car on December 15, the airfield was shrouded by a characteristic British fog. Miller seemed discouraged. Even the birds were grounded, he grumbled. Baesell’s pilot would probably never find the field. The rest of the band reached France three days later, but no one was waiting for them at the airfield. Haynes got the band settled into a hotel on the outskirts of Paris and then set out to find Miller. As the days wore on, it became obvious that Miller’s plane had gone down over the English Channel. There was still a war on, and Miller’s band had a job to do—even without him. Various personnel helped out with the musical direction, while Haynes continued as the outfit’s administrator and commanding officer. The American Band of the Allied Expeditionary Force made its first public performance without Miller on December 21 to a rapturous reception. It continued to play throughout Europe until it embarked for the return trip to the United States at the beginning of August. While crossing the Atlantic, news came that Japan had surrendered. Over the years, various conspiracy theories emerged to explain Miller’s disappearance. One had him killed during a barroom brawl in a Paris brothel, and another, expiring in the arms of a Parisian prostitute. There were rumors that German spies had assassinated him and the military had hushed up his death to preserve morale. Another story said he died in a British hospital from lung cancer. A more likely scenario emerged in the 1980s, when Fred H. Shaw, a former Royal Air Force navigator, reported on an incident that occurred during his return from an aborted bombing mission on December 15, 1944. Shaw said that when his Avro Lancaster heavy bomber jettisoned its bombs over the English Channel, he and the crew spotted a small plane far below them being blown out of the sky by the blasts. The British Ministry of Defence backed Shaw’s story and said in a statement that Shaw’s Lancaster was probably responsible for Miller’s death. In 1999, a Miller fan in Boulder, Colorado, paid $35,000 to buy Shaw’s logbook at a Sotheby’s auction. Chris Way, the author of Glenn Miller in Britain: Then and Now and a leading Miller authority, dismisses the conspiracy theories as “absolute rubbish.” Way believes the explanation for Miller’s disappearance is simple: his plane iced up over the channel and crashed into the sea. Way uncovered evidence that upsets the theory that Miller’s plane was knocked out of the sky by Shaw’s jettisoned bombs. Though some accounts said Miller’s was the only Norseman in the air that morning, Way found records showing that a Norseman attached to the Ninth Air Force also disappeared that morning, one hour before Miller took off from Twinwood. One indisputable fact in the story of Glenn Miller is that his music has long outlived him. The Glenn Miller Band still performs today, playing some 300 dates a year under the direction of trombonist Larry O’Brien. The Glenn Miller sound survives. The opening notes of “Moonlight Serenade” still conjure up a vanished era of big band swing and a world at war. Tom Huntington is a free-lance writer who lives in central Pennsylvania. He is a former editor of Historic Traveler and American History magazines. This article originally appeared in the April 2006 issue of America in WWII. Order a copy of this issue now. 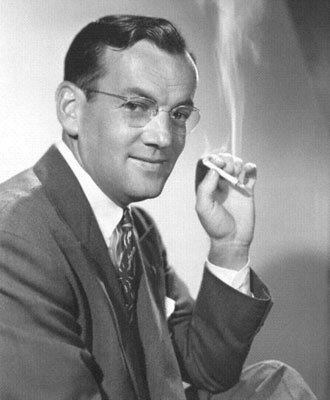 Top photo: Glenn Miller endorses Chesterfield cigarettes in a prewar ad. 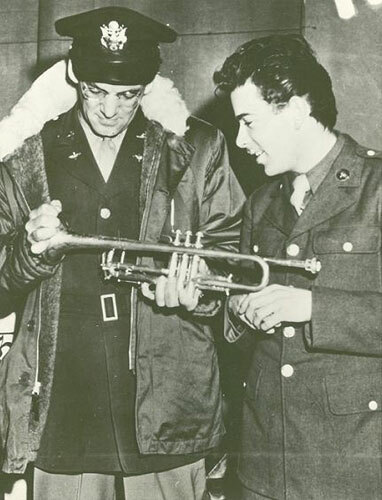 Pair of photos: Twenty-year-old trumpeter Private James Daniel Murphy, Jr., of Philadelphia meets the King of Swing during an Eighth Air Force Music festival in England . 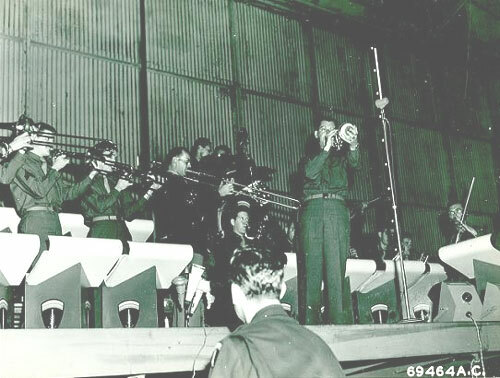 Miller (just left of center, on trombone) plays with his band at Steeple Morden, Cambridgeshire, England, August 12, 1944. 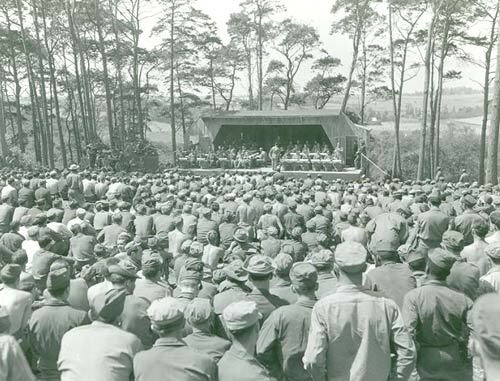 Crowd photo: Months after Miller disappeared, GIs listen to his band play without him, under the direction of Technical Sergeant Ray McKinley, at Camp Herbert Tareyton near Le Havre, France, on a Saturday afternoon in July 1945. 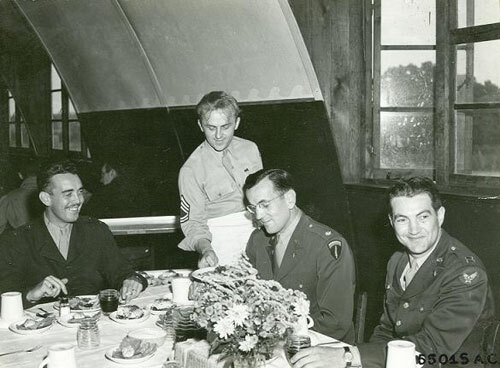 Bottom photo: Miller dines with officers at an Eighth Air Force base in England. Photo credits: National Archives, except the cigarette ad, which is America in WWII collection.